The U.S. Presidential Scholars Program offers scholarships to U.S. graduating high school seniors who have received exceptional scores on either the SAT or the ACT college admission test. The scholarship is by invitation only. Eligible students are selected by the U.S. Department of Education based on test records for the top 30 males and top 30 females in each state. From a total of 500 semifinalists, 121 students are selected to receive scholarships. Students chosen as U.S. Presidential Scholars are recognized with an expense-paid trip to Washington, DC in June. They will receive their medallion during a ceremony sponsored by the White House. They will have an opportunity to meet and speak with government leaders, scientists, educators, and others who are recognized for their accomplishments. They will also tour the nation's capital and other significant museums and monuments. Established in 1964 by a Presidential executive order, the U.S. Presidential Scholars Program recognizes some of the most distinguished graduating high school seniors. Each year, up to 141 deserving students are honored as Presidential Scholars. 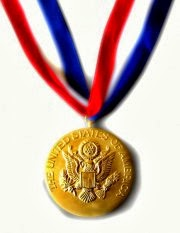 It is recognized as one of the nation's highest honors for high school students.